Above shown where patient needed density repair. Below after 4,000 grafts. Actor in his 30s has a nice thick head of hair, however, his hairline started receding and he believe this might negatively impact his career. He visited a hair transplant doctor address the balding by using outdated mini and micrografts. The hair transplant worked, but it really didn’t look that natural. As he lost more hair the old style work became more and more obvious. When he visited Dr. Feller he wanted his hairline lowered and the old work fixed. 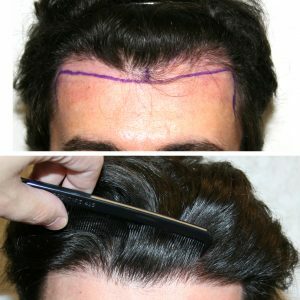 In one visit Dr. Feller transplanted over 2,500 FUT grafts which hid the old grafts and made the hairline much thicker. Patient visited for a second time to have another 1,500 grafts placed along the hairline to thicken it even more and lower it a bit. Both procedures were a success and even up close his hairline looks natural. To view more results from Dr. Feller, visit his HTW profile page.